Percussive attacks, each voice panned hard left and hard right. Slow modulation from the AR generators applied to the filters and VCO dynamic shape modulators. Slow modulation from the AR generators applied to the filters with high resonance, manually swept from low pass to band pass to high pass modes. 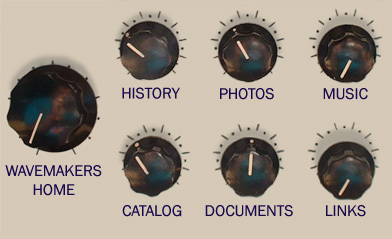 Enveloped Filters and VCO dynamic shape modulators, with audio frequency modulation applied to VCOs from the FM Generator. 3 MOTM VCOs to kb308 Triple Bandpass Filter to one channel of kb245 Quad VCA, processed by Electrix MO-FX digital delay. Kb308 and kb245 modulated by MOTM VC LFOs. Copyright (c) 2002 by Rick Petersen. Wavemaker 4 + effects.